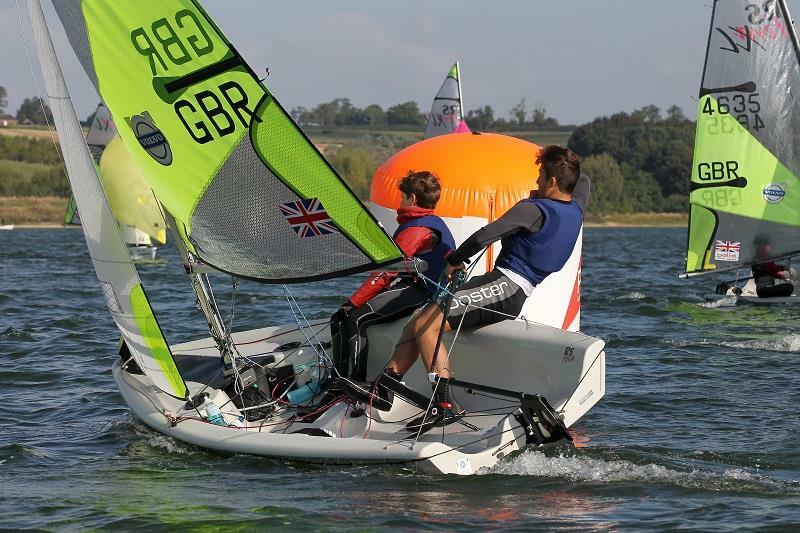 Northampton Sailing Club hosted the RS Feva Volvo Grand Prix and Bart's Bash event on September 20/21, with 39 competitors from around the country. 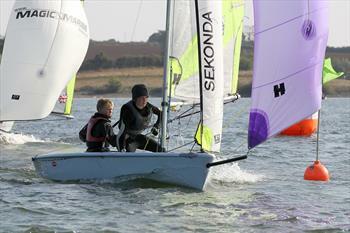 The event was the final RYA UK Junior Squad selector, so added an extra pressure to some of the sailors. Saturday saw an overcast, drizzly start to the morning. The first start got away, all clear, in 6 knots of breeze despite a starboard line bias. Iain Bird and Jake Hardman were first round the windward mark, closely followed by Henry and Rupert Jameson, with Daniel Lewis and Tristan Payne in 3rd. The top three pulled away in the light downwind conditions. By the 2nd windward mark, Iain and Jake held onto the top spot, but Daniel and Tristan snuck into 2nd place; with Jack Lewis and Lucas Marshall hot on their heels in 3rd. The Race Officer shortened the course with Iain and Jake taking the win; Daniel and Tristan 2nd; Jack and Lucas 3rd. The breeze dropped to 4-5 knots for race two with no sign of the sun breaking through the low cloud cover. Two boats OCS, but both returned and restarted. A port lift on the first beat helped Rory Odell and Josh Bonsey lead at mark one, 2nd Fin and Dan Armstrong; 3rd Emma Tardrew and Isobel Clark. By the leeward gate Rory and Josh hold onto the top spot with Emma and Isobel up to 2nd,3rd Fin and Dan. Positions stayed the same for the next lap. Again the course was shortened so Rory and Josh finish first, Fin and Dan 2nd; Emma and Isobel 3rd. The course was changed due to a shift in the breeze for race 3 with the wind still 5-6 knots. The race got away all clear but another shift made the beat biased so the decision was made to abandon the race. After a successful restart the wind steadied and at the 1st windward mark it was Matthew Caiger and Niamh Davies, 2nd Tom Holliday and Ollie Dennis, 3rd Jack and Lucas. But all change at the leeward gate as Jack and Lucas get ahead, with two pairs of brothers after that; the Jamesons in 2nd, and the Armstrongs in 3rd. Positions they held to the finish. Day two heralded beautiful conditions with sunshine and a steady breeze of 10-12 knots. Bart's Bash was the first of the 3 races. A clear start to Bart's Bash with the fleet spilt going up the beat. Matthew & Niamh lead at first windward mark, 2nd Fin & Dan, 3rd Henry & Rupert. At the first leeward mark, Matthew and Niamh hold onto 1st place but Jack and Lucas sneak into 2nd with Fin and Dan in 3rd. By the 2nd leeward gate Daniel and Tristan fly downwind leg to round it in 2nd, Fin and Dan hold onto 3rd. Next time round Jack & Lucas climb to 3rd but by the finish Daniel and Tristan took the gun from Matthew and Niamh; 3rd Jack and Lucas. Lovely warm sunshine, clear skies, great breeze. Perfect conditions for Bart's Bash....Bart would have loved it. The breeze picked up to 12 gusting 15 knots in race 5 and it was girls in front at the windward mark. Freya Black and Hattie Cage 1st, Daniel and Tristan 2nd, Jack and Lucas 3rd. By the 2nd leeward gate Rory and Josh pulled through to lead, Daniel and Tristan 2nd, Jack and Lucas 3rd. By now it was good planing conditions, tight fleet racing, with plenty of opportunity to pick up a few places in the shifts. At the final windward mark Rory and Josh stayed in front and held the lead to the finish; Jack and Lucas moved up to 2nd; Freya and Hattie were in 3rd but were overtaken at the finish by Matthew and Niamh. The final race saw a very well behaved fleet, and amazingly the black flag had remained in the box all weekend which must be a first ! Charlotte Ormerod and Maddie Wylie led at the windward mark; Jack and Lucas in 2nd with Louis Wright and Jamie Allen in 3rd as the breeze shifted and increased to 15 gusting 18 knots. By the leeward gate the girls are still in the lead with the Jameson boys climbing up to 2nd; Louis and Jamie in 3rd. Thereafter, there's carnage as boats avoid those capsizing! On the next windward mark Daniel and Tristan have fought through to 2nd; and Rory and Josh to 3rd. But there are 'thrills and spills ' to come, so the race is far from over. By the gate Rory and Josh pull up to 2nd but by the final windward mark Matthew and Izzi have taken the lead whilst Charlotte and Maddie drop to 2nd, the Jamesons are in 3rd. But by the finish it was 'birthday boy' Henry Jameson and brother Rupert taking the gun from Matthew and Izzi whilst Charlotte and Maddie had to settle for 3rd. The close battle in the final race resulted in Rory and Josh finishing on equal points with Jack and Lucas but taking the win on discard.